Sumit, an entrepreneur from Madhya Pradesh, reached us to open a new branch for his startup. The startup was already couple of years old and was generating a good amount of cash flow. It was a pretty impressive idea on which the whole startup was based. Sumit was a techie, so was unaware of legal compliances. To my surprise the startup was not complying to even basic formalities. I asked him about the compliances, so he said that the person, who had formed the company for them, told that they don’t have to comply with any norms for first two years (surprising, but that was his answer). I remained silent for minute, and then told him that the company & the director may have to face a serious action from the Ministry of Corporate affairs (MCA), if the rules are not complied with. Luckily, we were able to do all the compliances and thanks to MCA which provided the immunity certificate to the startup under a temporary scheme, otherwise, the director of the company may face the prosecution. Read the above story very carefully, not every person is so lucky to avail the MCA scheme and protect it from the prosecutions. We, at Quickcompany.in, deal with many new start ups on a daily basis, we find that startups are now reasonably knowledgeable about various forms of business incorporations, but only 1 in 10 knew about the compliances which are mandatory to be complied with after the incorporation. Now every new company, after its incorporation, must apply for business commencement certificate. It is like a declaration in the prescribed form that the members/shareholders have paid to the company the value against their share capital. This declaration is to be filed within 180 days from the date of its incorporation. To file the commencement certificates, INR 100,000 in case of private company and INR 500,000 in case of public company should be deposited in a separate bank account of the company. Also, if the commencement certificate is not filed within the due time, then penalty may be levied upon the company and registrar may wind up the company. The board meetings are very essential for type of business decisions. As per the law, every newly incorporated company must call its first board meeting within 30 days of its incorporation. Also, it must be noted that for every board meeting there must be a prior notice. Also, during the meeting at well, proper minutes of the meeting should be made and kept. This first board meeting is really very important, because generally many kinds authorization are to be made by this resolution only. Every company has to appoint the auditors in its first board meeting through form ADT 1. The process of appointing the auditor is a bit different. 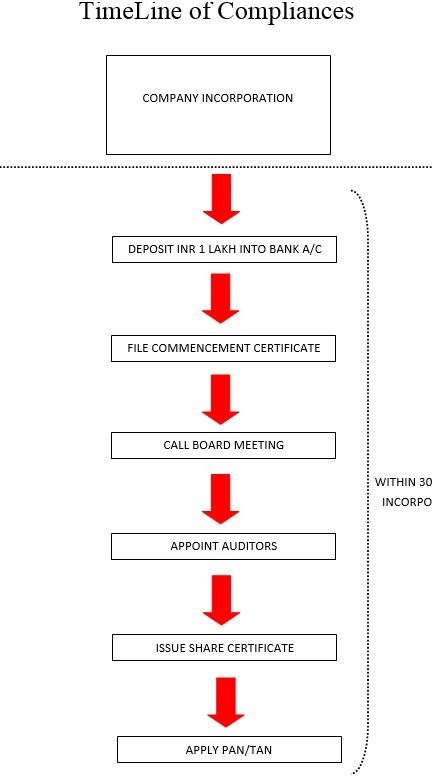 First of all, a written intimation is to be delivered to the auditor, then auditor will give its written acceptance and in the end the board resolution will be passed and the appointment of auditor is complete. The fees of the auditor are generally mutually decided between the directors and the auditors. Every company should issue the share certificates with proper common seal, to the members of the company and the same should be properly stamped. Share certificates are the valid proof that this person holds that much share capital. Generally people don’t have these share certificates, however it is always recommended to have share certificates. Every agreement, resolution passed at any meeting or between any stakeholders of the company should be filed to Registrar of Companies (ROC) through form MGT 14. This has to be filed with the ROC otherwise every resolution which is not filed will render it invalid. Every resolution, agreement etc should be filed within 30 days of passing otherwise; 3 times penalty will be levied. As per the new norms, every letter head, resolution or any formal document of the company should have mandatory particulars printed like Company identification Number (CIN), registered office on the top of the letter head or at the bottom of the letter head. PAN is very common and every start up must be knowing that, however, TAN is something different, TAN stands for Tax Account Number (TAN), every company who is eligible to deduct TDS as per the income tax, must obtain TAN in order to obtain TAN. These above compliances are not the exhaustive list, but the inclusive one. We know, this is not something startups know, but they should, in order to protect their business from various penalties and prosecutions. Therefore, it is advised to work with a professional; however, keeping yourself aware of things is always good. Incase you have any questions, do drop us a comment. 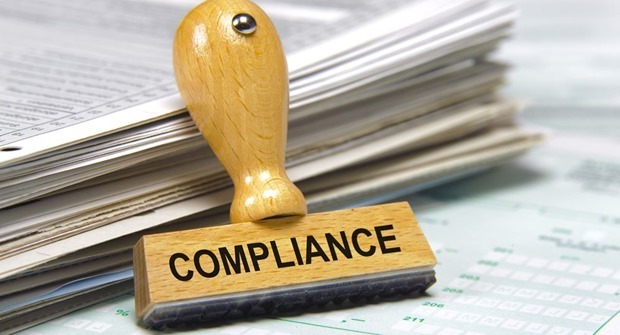 "7 Must-Have Compliances After You Incorporate A New Company", 5 out of 5 based on 1 ratings. Jan Dhan Yojana Enters Guinness Book Of Records. But Banks Are Bleeding High! AJSH & Co assists NRIs and foreign nationals to start and set up own business in India. At AJSH, we provide hassle free, professional service for Company Registration and Limited Company Formation in India.